All four southwestern deserts. Southern Nevada, extreme southwest Utah, southeastern California, southern third of Arizona, southern New Mexico, into west Texas and south into Mexico. Well-drained slopes and plains, especially those with a layer of caliche, up to 4,000 feet. Often the most abundant shrub, even forming pure stands. 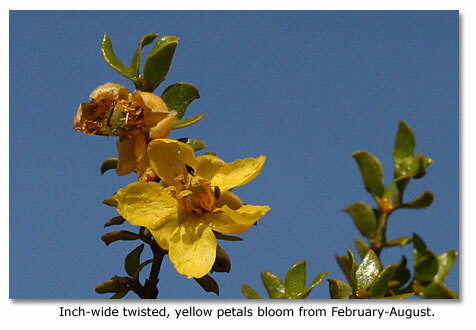 Inch-wide twisted, yellow petals bloom from February-August. Some individuals maintain flowers year round. After the Creosote blooms the flower turns into a small white fuzzy fruit capsule that has 5 seeds. You can find these seed capsules on the ground under the creosote bushes. 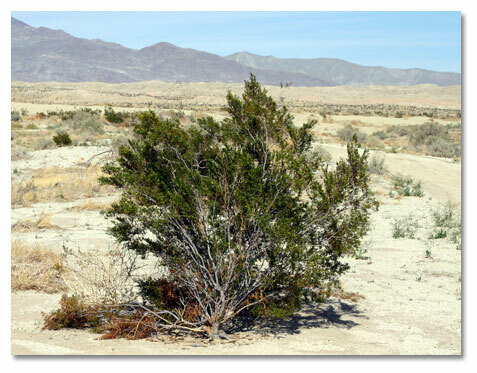 The Creosote bush is the most characteristic feature of North America's hot deserts. It is one of the best examples of a plant that tolerates arid conditions simply by its toughness. It competes aggressively with other plants for water, and usually wins, accounting for its prevalence in many arid locations of the southwest. This medium-to-large evergreen shrub has numerous flexible stems projecting at an angle from its base. It is usually less than 4 feet high, but can grow to 12-foot heights with abundant water. 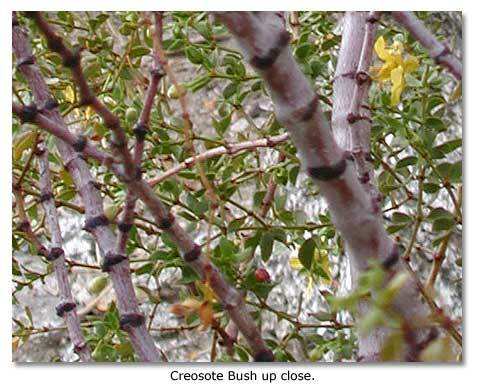 Its small (1/4 to 1/2 inches), pointed, yellow-green leaves have adapted to conserve water and dissipate heat. The bush may lose some of these waxy, resinous leaves during extreme drought, but never loses them all. These leaves are especially pungent after a rain, and have been used as antiseptics and emetics by native peoples. Its foliage provides refuge for crickets, grasshoppers and praying mantids. How to grow from seeds. Place several of these seed capsules in a shallow pan cover with boiling water. Let them soak over night, and then place a few seed capsules in a pot with soil and start to water. Thin out the extra seedlings and plant.